When you take a moment to look around the church you will probably see many people you haven’t had an in-depth conversation with or perhaps haven’t even formally met. We all know how important it is to have relationships within our church family, but we often don’t have the opportunity to connect with many of our brothers and sisters in Christ. Table For 6 is a new ministry with the mission of increasing connectivity within Willow Park Church. 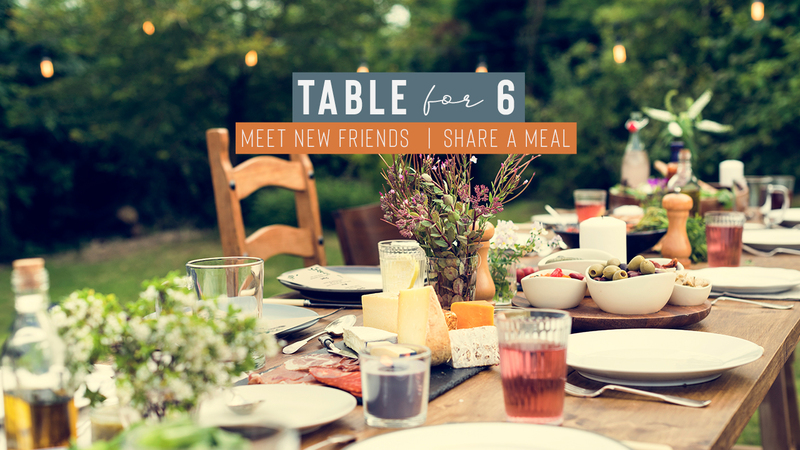 Table For 6 is a home-based potluck social time where couples and individuals age 17 and up can gather at the table for food, fellowship, conversation and fun. There is no fee for registration and signup is easy (see below). You can sign up as a single individual or as a couple. A program coordinator will sort everyone into groups of six and contact you with all the information you need to plan your first meal together. This is for ages 17 and up. See “Guidelines for Hosting” below. People listing themselves as hosts take turns hosting. The host consults with the group to arrange a Date, Location (usually their home) and a Two-Hour Time Slot which can be in the morning, afternoon or evening. The Host provides beverages and one dish and will delegate other menu items to the other participants. The meal can be anything from full-scale dinner to brunch to just appetizers or desserts. During the gathering, the group will decide on a Host, Location and Date for the next Table For 6. Gatherings are limited to about two hours with no other agenda than conversation and enjoying the company of others while sharing a common meal. After you have hosted, contact the program coordinator to let him know when and where it happened. Also let him know of any suggestions the group may have for improvements.